What are the benefits of landscape lighting and what are my options? The final touch to any residential landscape project is to capture that attraction day and night. Outdoor Lighting is a critical step in the art of transforming the look of your home and it is often an overlooked element! Landscape Lighting takes curb appeal from good to great. 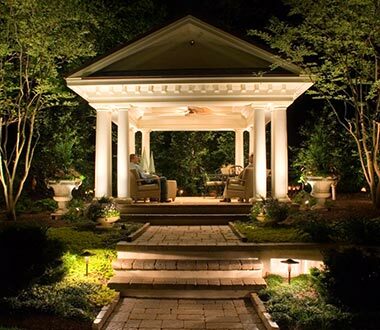 If you are interested in developing your Northern Virginia home’s appearance, consider adding one of the many types of landscaping lighting options which are easy and affordable install. Moon Lighting: effective for expressing the look of moonlight upon an object. Up Lighting: focuses on trees, ornamental bushes and shrubs along with architecture. 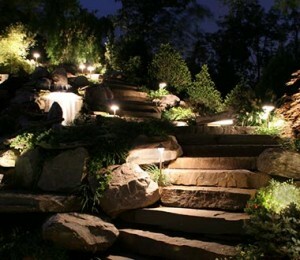 Never worry about turning your landscape lighting system on or off. Automation is available with automatic timers with phot cell control turning on at dusk and off at dawn. 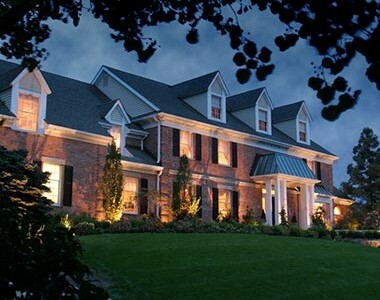 Outdoor lighting adds beauty and character to your homes appeal, but it also adds security and safety. Lighting pathways, steps, and entrances are excellent ways to add visibility and protection during the night and early morning hours. Increasing your outdoor time with family and friends is also great for your health! O’Grady’s Landscape has been in business since 1991 and are passionate about landscape design, installation and maintenance in Northern Virginia. Or mid-size company and depth of experience allows us to diversify our product offerings while still maintaining excellent customer services. Our team would like to consult with you to enhance and illuminate your home’s beauty!